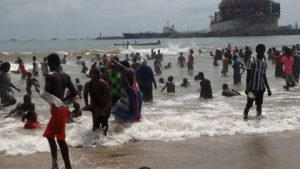 Hundreds of residents of Tema Newtown have since Monday been trooping to the beach daily to take a bath in the sea in what they say is a purification ritual. Their action comes after a directive from the Chief Priest of the Town, Numo Ashiboye Kofi, who said they needed to fortify themselves against a curse that has resulted in the supposed mysterious death of some residents. The residents reportedly paid GHs 1 each to the purification team led by the said traditional priest before rituals were performed on behalf of the individual. About nine persons reportedly died in the area in the last two weeks under strange circumstances. The situation has led to mass hysteria in the area. The Chief Priest of the Town, Numo Ashiboye Kofi claimed that there was a curse on the area due to the high incident of armed robbery and there was the need for residents to purify themselves at sea consecutively for 3-days to be spared from death. But the Tema Shipi, Nii Armah Somponu II, has called for calm among residents saying that the deaths may only be coincidental or natural and not spiritual as claimed. Nii Somponu added that the Tema Traditional Council had contacted and invited the Tema Metropolitan Health Directorate to investigate the cause of the deaths. He noted that the Council could not attribute the death to a curse or any other thing supernatural until the investigations were completed. He stressed that the Council had not sanctioned the holy bath in the sea nor the payment of money for the reversal of the alleged curse. According to him, one of the deceased was stabbed, another from sickness, one other was pelted with stones, while another died out of shock when he was informed of his child’s death.